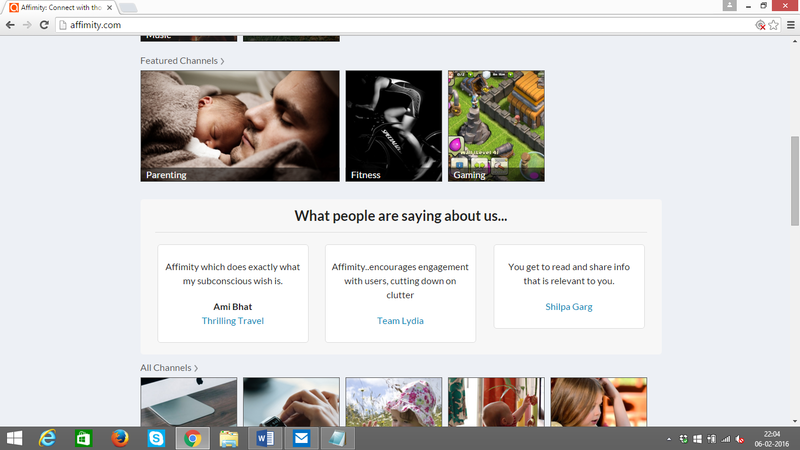 I am happy to introduce a brand new social media platform - Affimity.com on my blog. You must be wondering what is new about such platforms. And you are right to question that. For in the days of a fast and furious world, we are surrounded by all kind of social media networks. We have facebook, twitter, pinterest, reditt, quora, and heck, even our smart phones are loaded with whatsapp, wechats, instagram, telegram etc. So what difference can any new network offer? Well, let me tell you what it is and you be the judge yourself! A social media platform targeted at bloggers. Yes, I did say bloggers. People who have found their stronghold in what particularly interests them. The social networking feed consists of topics that are nothing but meaningful to you as here you connect not just with random friends or acquaintances but with likeminded people, people who share your interests or passions. So no more cluttering of your news feed with unnecessary posts, or weird selfies or that-doesn't-concern-me forward messages, here the content is only what your heart desires. Just as you login to the site (which you can do either by creating your account or directly via facebook) you will be greeted by the user interface and their page layout. You will get the feeling that this site is one stop point that can cater to all kinds of interests. 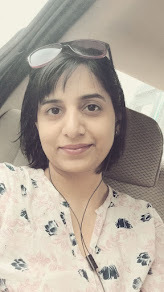 Affimity provides various channels viz Food, Movies, TV Shows, Celebs, Book Club, Music, Career, Parenting, Fitness, Random Thoughts, Gaming, Digital Life, Wearables, Allergies, At Home Moms, Working Moms, Tennis, Motor Sports. 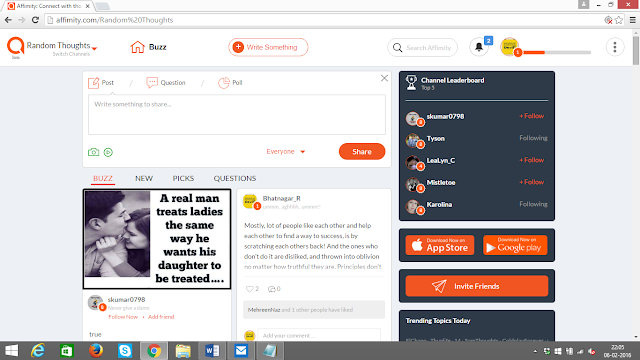 Based on your interest, you can select any number of channels and you will get the relevant posts on your news feed while you may also share the Buzz, New feeds, Top Picks and Questions pertaining to that subject. You also may ask a question or take a poll or upload a picture or a video on the channel of your choice. And the best part of the deal, you get to meet and be friends and have followers in people sharing the same passion, same interests. A kindred group. And of course you can engage within the network through comments and likes and also, can share posts of interest on other social media viz Facebook, Twitter, Google+ and email. If you are wondering if this is enough than hold on, Affimity also, has a convenient mobile app already so that you can remain connected on the go.